Are you interested in becoming a better marketer? Do you have a lot of questions about marketing and all of the changes that are occurring as our world becomes more and more digital? 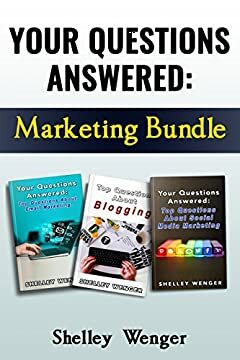 If so, Your Questions Answered: Marketing Bundle just might be the right book for you. Filled with three quick reads offering answers to the most commonly asked questions when it comes to social media marketing, email marketing, and blogging, it will help you become a master at marketing. In Your Questions Answered: Top Questions About Social Media Marketing, Shelley Wenger answers all your questions with regard to social media marketing in a consistent and yet simple to understand way. This book will unlock your social media marketing potential and you (and your business) will soon start enjoying the benefits of social media marketing. The book is highly informative and resourceful. It is also custom made for business owners because it is short and to the point. You can easily read it in one quick session instead of wasting hours reading a book, which is the last thing they would like to do. The book is highly informative and resourceful. It is also custom made for business owners because it is short and to the point. You can easily read it in one quick session instead of wasting hours reading a book, which is the last thing they would like to do. Grab your copy today for more. Your Questions Answered: Top Questions About Email Marketing is a book that every small business owner and freelancer must read. Most business owners have an invaluable (and relatively inexpensive) way to market their business, using the email addresses of current customers and potential customers. Email marketing enables you to send a flyer or a business card without having to print it, cutting your printing costs while improving efficiency. Your Questions Answered: Top Questions About Email Marketing is full of practical tips on how to start and perfect the art of email marketing. The book will give you the tips on how to send great emails that will have an impact on the target audience. It will even give you advice to get the right email list so that your marketing campaign will be successful! If you donâ€™t have a blog for your business, you must read Your Questions Answered: Top Questions about Blogging. Though most people think that writing a blog is a time-consuming drain, it doesnâ€™t have to be. It can be short and effective, bringing you new followers or sales with just a few lines each day or a couple of times a week. Whatever frequency you decide upon, Top Questions about Blogging will help you answer the questions and silence the nagging doubts about this great way to promote yourself and your business. Get your copy of this fabulous bundle NOW!